The British Navy’s fourth Ark Royal was their largest warship built in the 20th Century. There were two ships in this class laid down in the midst of World War Two. The British Admiralty had the construction of both ships put on hold, as they believed they could not be completed in time to take part in the war. In the years following the war, changes in design delayed their completion even more. Originally to be named Audacious, the first of the two ships entered service in 1952 under the name Eagle. 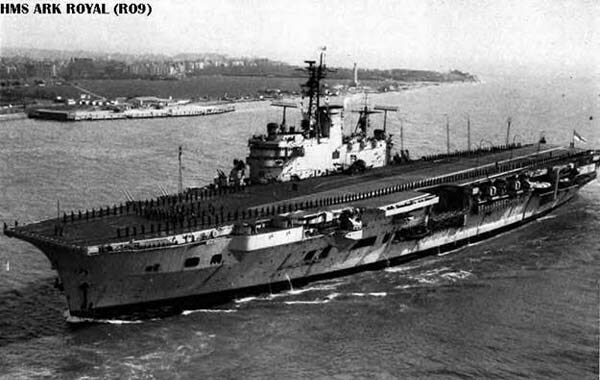 The second ship originally to be named Irresistible, entered service in 1955 under the name Ark Royal. After the cancellation of a 50,000-ton British carrier design in 1966, Ark Royal had to go through a refit and modernization program in 1967 to help keep her in service longer than intended. The completion of that work increased her displacement to 53,000 tons and her flight deck to 169 feet wide. Ark Royal re-entered service after the refit with an air wing of 12 F-4 Phantoms, 14 Buccaneers, 4 Gannet AEW aircraft and 6 Wessex ASW helicopters. Eagle was the only one of the two ships to be involved in a war, this being the week long Suez Canal War in 1956. By the early 1970s, both ships were showing their age and had become expensive to maintain. Eagle was taken out of service in 1972 and placed in reserve at Plymouth. With Ark Royal’s continuing maintenance problems, Eagle was stripped for spares to allow her sister ship to continue in service. The Admiralty had Eagle towed to the Clyde/Scotland for scrapping in September 1978 and decommissioned Ark Royal two months later. As Ark Royal was being dismantled at Cairn Ryan/South West Scotland, Argentine troops invaded the British controlled Falkland Islands April 2nd 1982. Large Image of the HMS Ark Royal next to the nuclear powered carrier USS Nimitz. The scrapping of Ark Royal forced the Royal Navy to fight a war with aircraft carriers that could only carry sub-sonic Harrier Jump Jets. Although these were highly maneuverable jets fitted with American Sidewinder missiles, they struggled to protect British forces from the Argentine supersonic French designed jets. The carriers that Britain then relied on were the Invincible class vertical take off and landing carriers that began entering service in 1980. The introduction of Harrier’s led to this new design of ship that no longer had to be large enough to operate the large jets in service at that time. The Ilustrious class carriers are 17,000 tons with ski jumps on the bow. This allows the Harrier’s to carry heavier loads and save fuel on takeoff. The third carrier of this class entered service in 1985 as the fifth ship to use the name Ark Royal. The flagship of the British fleet at that time, this ship differs slightly from her two sisters Invincible and Illustious, as she has a 12-degree ski jump compared to the 7 degrees of the other two ships. The Sea Harrier's were taken out of service in 2006, leaving these ships with no fixed wing aircraft. Ark Royal V was put up for sale in 2011, and Invincible was towed to Turkey for scrapping in 2011. Illustious will be operated as a helicopter carrier untill 2014. The new 65,600 ton carrier HMS Queen Elizabeth is expected to be fully operational in 2020.